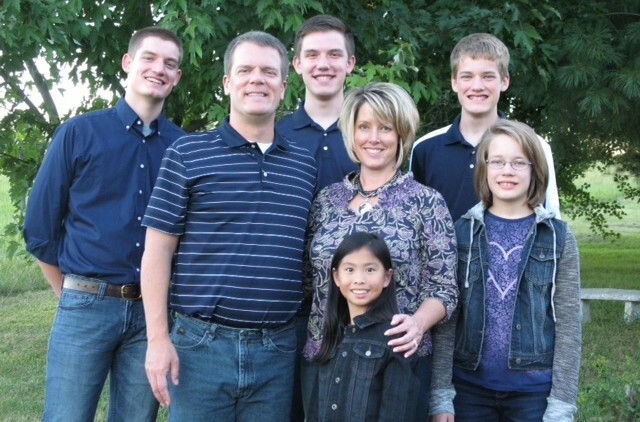 This summer we had the special opportunity to host Ryan for 3 weeks through a program between China and Nightlight Christian Adoptions. God wove our hearts with Ryan's as he lived with us. Ryan is a Farley. He was thriving in our home and it broke our hearts to have to send him back to the orphanage. God's ways are greater than ours and even though Don and I knew that another adoption may be in our future, this timing caught us off guard financially. We are overjoyed that God brought Ryan into our lives. Ryan is an 11 year old Chinese orphan. He was abandoned in his first year of life and has been living in orphan care since that time. Ryan was born with bilateral microtia (malformed external ears). He does not have openings to his ear canals and is diagnosed with bilateral conductive deafness. However, he could hear us and communicate with us this summer. With new options in hearing aids, Ryan should be able to have near normal hearing. Ryan is very athletic, smart, and loving. I am so excited for the Farley family. What a wonderful addition Ryan will be!